My goal is to provide customers low-cost lodging in the Snowshoe Village while ensuring a comfortable vacation. My low price guarantee is valid from mid-March through the first weekend of skiing. I'll beat any verifiable, comparable Mountain Lodge offer during those dates. I have additional condos if this one is booked. Snowshoe Resort is a year-round vacation resort. In the winter, you can enjoy 60 different ski slopes, three terrain parks, tubing, cross-country skiing, and snowmobiling. After the slopes close you can stroll through the Village's restaurants, shops, kids’ entertainment zone, nightclub, full-service spa, and a teen center for those 20 years old and younger. In the summer you can plan on a significantly cooler climate in the mountains where you can hike, geo-cache, lounge at the mountain lake, mountain bike, fish, paddle-boat, shoot sporting clays, ride RAZR 4-wheelers, or golf at Raven Golf Course. There is even a zip line, climbing wall, and Euro-bungee right in the Village! Year-round you can sightsee and swim, or drive off the resort to see live theater or ride on the Cass historic train. Activities and time tables change annually, so double-check with Snowshoe to ensure the activities you want will be available when you plan to be there. The Mountain Lodge is a Ski In/Ski Out complex ideally located in the Snowshoe Village and next to the slopes, and has its own private parking lot (free to Mountain Lodge guests). You’ll be 30 yards from the Ballhooter Lift and the Beginners’ Slope, all within the Basin. The indoor pool/hot tub/ sauna (additional charges apply), church, and general store are only a short walk from your building. Your condo at the Mountain Lodge is also within walking distance of the Western Territory slopes and the shuttle to night skiing at Silver Creek, giving you outstanding access to all 60 slopes. On the ground floor, you’ll find a relaxing lobby with a warm (in the winter) fireplace. Mountain Lodge common areas and condos each have their own dedicated wi-fi. You’ll have an arcade in the building, as well as Snowshoe’s conference rooms and the Comedy Cellar. Mountain Lodge also offers a nightly movie during the ski season. Mountain Lodge is the only building on the mountain with on-site maintenance, just in case. The mild weather most of the summer at the top of the mountain allows for the lack of air conditioning in the building and in most condos. Despite this, some condos do have interior air conditioning. Please check the condo’s amenities for details. Unless otherwise coordinated, your housekeeping fee includes an initial set-up of linens, towels, paper towels, toilet paper, trash bags, dish soap, bath soap, coffee filters, and facial tissues. Replacements and/or additional supplies are available for a fee at the front desk. You’ll have a spacious two bedroom condo that easily sleeps six and is one of the few units with air conditioning. The kitchen is well-stocked with dinnerware, utensils, pots and pans, coffee maker, oven, microwave, refrigerator, toaster, etc. so you can bring food to eat-in. 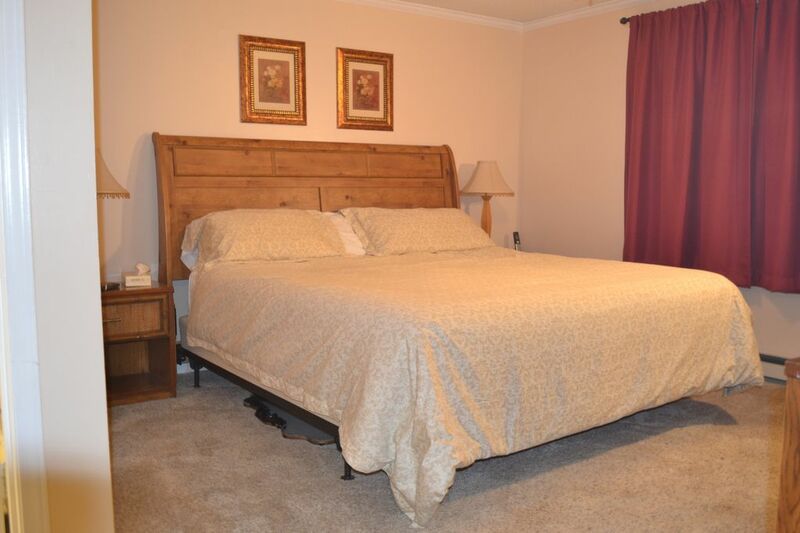 The master bedroom has a king size bed, one of the few in the building. The smaller bedroom has a queen size bed. Each bedroom has a TV with cable and DVD player. There’s a sleeper sofa in the living room, along with the air conditioning unit. There are two full bathrooms, a TV/VCR/DVD player in the living room with DVDs, VHS tapes, an XBox with games, and a mini-library with 30+ books. Other videos can be rented downstairs in the lobby or at Wildcat Provisions. Your condo will have a built-in ski rack, wainscoting, digital thermostats throughout, and a balcony. Each bedroom and the living room have ceiling fans, unlike most of the rest of the Mountain Lodge units. Your cell phone may not work in and around Snowshoe Mountain. The area east of the mountain is a quiet zone due to the Green Bank National Radio Astronomy Observatory. As of 2015, AT&T has service at the resort, but not down the mountain to the east. Your GPS will work everywhere, but don’t count on your phone working (voice or data). Guests may begin checking in at 5:00 PM. Guests MUST be checked out by 11:00 AM - no exceptions. In the picture I'm on the left, with my wife. My business partner is on the right with his wife. I hope my home away from home is as cozy for you as it is for me. I loved the scenery and the skiing. You really won't find better skiing east of the Mississippi unless you go into the New England states. It's a great place to spend some time with the family and just relax. It's nice to know the people up there on the mountain when we arrive. They're truly a wonderful group of people. Snowshoe Resort is in a remote section of Southeastern WV. In the Snowshoe Resort Village. Property is located atop a mountain. Building opens up onto the top of the Ballhooter lift. Free long-distance within the continental US. New standing unit as of spring 2013. You won't need it often, but it's there. Each room has its own free Wi-Fi. Living room and one in each bedroom. Over 30 books to choose from. In the summer at the bottom of the ski lift, at the lake. Ski-in / Ski-out. 20% equipment rental discount at the local rental facility. Pocahontas County has numerous vacation options during all seasons. WV has great skiing, and plenty else to offer! The Split Rock Pool is just across the parking lot. It has a heated indoor/outdoor pool and hot tub (open even in the winter). You'll have to pay Snowshoe separately for this amenity. The building shows kids' movies in a common area during the ski season. The unit was very clean and cozy and has had updates that the listing doesn't show...large flat screen tv in the master bed with actual hi-def channels, new carpet, and a nice large farmhouse table in the dining area. The beds were very comfortable, which is probably the most important thing...and the automatic ice-maker was a pleasant surprise that many of condos surprisingly don't have. Tim was great to work with. Would definitely stay here again. Me and two of my buddies took our 7 YO girls skiing for the weekend. It was a perfect set up and the girls had a great time. We thoroughly enjoyed our time in this condo. Tim is excellent to work with! I love the ski in, ski out! Walk out the door, put on my skis, and fly down the hill? Yes please! Also, the staff are so friendly and accommodating, and Tim is an absolute gem to work with. I am already trying to figure out when I can return! Great Location, plenty of room! Room was exactly as pictured and was well stocked with kitchen utensils and most other things you would need. Room is right on the slopes. We had a minor hiccup while there. The weekend we stayed had close to record low temps (-20 with wind chill) and the heat in the room couldn't keep up with the crazy cold outside. Fortunately, the very helpful front desk staff brought us a space heater while Tim worked on getting us to a different room with better heat. Ultimately we were upgraded to a 2 bedroom unit on the other side of the building for free and it didn't hinder the weekend at all. Hopefully this was once in a decade cold and it won't be an issue in the future. Either way, I was impressed with the quick solution. Would stay here again! Pocahontas County has numerous vacation options during all seasons. WV has great skiing, and plenty else to offer! 1) Stays of 30 nights or more incur no 12% tax, do not require housekeeping, and are deeply discounted. 2) Stays of 4 nights or more earn discounts between 10% - 20%. 3) Rates are subject to change until time of booking.